Do the lights in your property flicker? This may be a sign that your electrics are faulty. Contact Merrivale Electrical immediately and we will run our Poole electrical testing and inspection on the wiring in your home. At Merrivale Electrical, we have expert electricians at hand to carry out a wide range of electrical maintenance to your property. Do you suspect that there are faulty wires on your property? Call in the experts at Merrivale Electrical and we will carry out a comprehensive electrical testing and inspection in Poole. If you have experience with any of the signs above, then we recommend you enlist the help of our Poole electrical testing and inspection. Many mortgage lenders, insurance companies and lettings agents will want to see proof that your property is safe. This means that it’s essential that your home undergoes regular electrical inspections like a Home Buyers Report. Certificates like NICEIC prove that your electrics are updated and properly fitted by an approved board in the industry. Do you want to buy a property? At Merrivale Electrical, we have encountered many clients who have made the mistake of buying a property without making the necessary checks. If you want to buy a property, we recommend that you do your research before buying the property to find out whether the electrics are fully operational and working safely. This is where Merrivale Electrical comes in. We are happy to carry out periodic inspections on any property whether it is domestic, commercial or industrial, to ensure you are completely aware that property you are buying into is completely safe. Electrical faults can appear in any property of any age, which is why it is important to carry out regular and necessary inspection reports. At Merrivale Electrical, we have the respect of being a trusted company that will carry out your electrical testing and inspection in Poole to the highest standards. As proud members of Check-a-Trade and NICEIC approved, you can rely on our electricians to keep your home safe in the electrical department. 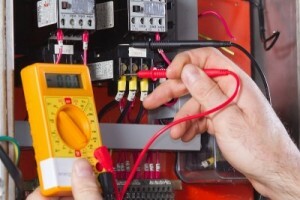 If you suspect that your wiring is unsafe, don’t hesitate to get in touch with Merrivale Electrical for our Poole electrical testing and inspection services. Call us on 01202 389197 or send an email to info@merrivaleelectrical.co.uk.